ANBAD has returned from a break in Barcelona, Europe’s Most Hash-Scented City™, where the supposed relaxation was punctured with the realisation that Barcelona’s pop music is a truly soul-shaking blend of Depeche Mode and happy-clappy moron-o-dance. Note that this mixture of music is not in the same song – yet. Surely the creation of such a bowel-loosening monstrosity will only be a matter of time. 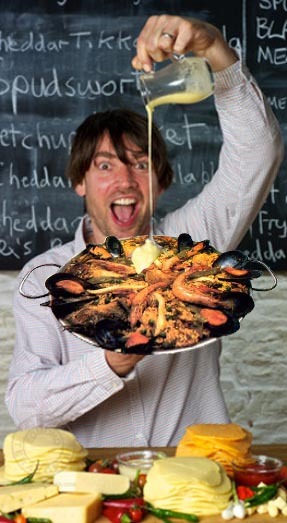 Now that the ANBAD Midweek Mixtape is the official Alex James Cheese Resource, here’s a picture of him getting into the Catalan spirit with his ‘Spudsworth melting cheese’. FIRST: Hey, what do you think of the burgeoning Slovakian music scene? What do you mean, you haven’t heard any Slov-pop? In that case, Odd Logic can be your primary port of call, with burbling and discombobulating clicky dance music to make your head spin and nod all at once. SECOND: First They Took Manhattan classify themselves as Doom Pop. Do not confuse this with Doom Metal, which is something entirely (and ludicrously) different. Their songs are indeed a bit gloomy, but wholly pleasant all the same. Life’s a bit like that. THIRD: Sneak Peek have set themselves up for a fall, haven’t they? When they’re seven albums in to their globe-straddling career and playing Wembley Stadium, their songs won’t be a sneak peek of anything any more. Time does that to songs. Still, while the songs are still green and new, enjoy what are literally sneak peeks into Sneak Peek: lullabies with fuzzy guitars. FINALLY: Washington Irving have a band name that is surely a lawsuit waiting to happen. So before the writ is served, get stuck into the delightfully – and here’s a word I usually try to avoid – heartfelt songs in their canon. Mmm, jangly. Posted on September 28, 2011 by Joe Sparrow. This entry was posted in Headline, Today's New Band. Bookmark the permalink.